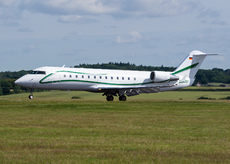 The Challenger 850, took off with two flight crew members, one cabin crew and ten passengers at 11:41 LT from Tromsø, Norway, for an on-demand commercial flight to Geneva. After an uneventful flight, the flight crew began the descent at 14:53 LT in clear skies and good visibility conditions. Three minutes later, the indicated airspeeds, pitch and roll data (flight attitude indications with respect to the transverse and longitudinal axes) were no longer available on both primary instruments. The flight crew observed that the airspeeds indicated were different and disconnected the autopilot at 14:58, without noticing the divergent indications of the two attitude indicators. During the rest of the flight, the crew is occupied by the flight speed not displayed on the left side or by the wrong speed indications (unreliable airspeed indication). The crew did not entirely consult the appropriate checklist in accordance with the Quick Reference Handbook (QRH). On several occasions, the air data source (Air Data Source), which inter alia generates the speed on each primary instrument, is switched. At 15:02, the flight crew radioed the Geneva air traffic control service an emergency situation, referring to the accident of the same aircraft type on 8 January 2016 in Sweden (SE-DUX). The air traffic control question regarding weather conditions remained unanswered. As the flight continued, the captain and first officer exchanged control of the aircraft several times, but failed to analyze and resolve the problem of incorrect left side speed indication. At 15:10, all cockpit instrument values were congruent again and the crew reported this to Air Traffic Control. The landing in Geneva finally took place without further incident at 15:20. Due to the emergency situation, Geneva airport was temporarily closed. Three airliners were diverted to other airports, while another 18 aircraft were diverted to the holding circuit. The investigation showed a failure of the left primary instrument speed indicators for about nine minutes. A simulation of the data at Bombardier showed that the right-hand airspeed data was consistent with the data to be expected at all times given the surrounding conditions, configuration, attitude and performance. The right primary instrument therefore displayed correct data throughout the flight. The values of the standby instruments were not recorded by the FDR. No trace of water or moisture was found in the ventilation ducts. The Air Data Computer 1 (ADC1) which caused the problems was replaced along with two pitot tubes (right side and standby) after this serious incident. The subsequent system check revealed nothing abnormal. The difference between the two pitch readings was due to an error in the ADC1 whose signal is used to calculate the pitch. Deviations from the recorded pitch values of up to six degrees and roll values of up to two degrees varied within the permitted tolerance according to the manufacturer. The abnormal procedure checklist recommended by the QRH explains on more than thirteen pages how to proceed if the displayed speed is unreliable. In this procedure, the Air Data Source Selector switching is only mentioned on page five. In this instance, the QRH did not provide adequate assistance to the crew of the D-AJOY. The Air Data Source Selector had been switched several times, but the ADC1's failover switch remained in the correct position for more than a few seconds. This suggests an inadequate crew response. The use of non-standard-ICAO-phraseology has also partially limited the understanding and clarity of communication between the D-AJOY flight crew and Geneva Air Traffic Control.